Silsila (Curry) by Braemore. What it came in the mail, I was just thrilled with the colors! They are almost perfect matches with the wall colors. So we started hanging the curtain rod. We mistakenly started drilling into the corner bead on this ceiling part, whoops! It had to be moved over about an inch. I would just stand back and observe, then run over there and position things, stand back again to see how it was looking from farther back. Eventually I was able to get some fabric up. Because the rods on the sides are 'cheated' a bit, the side panels are a little farther away from the walls. I still think it looks great. Now I just have to actually make the curtains instead of having the fabric just pinned on there. Oh, and we have to bring our table in here, pick out and buy stools, tile the entire backplash, make shelves, and hang the range hood. I think we need some help. Very pretty Sara! Your kitchen is coming along nicely. Can't wait to see it all done! They look great! The colors really pop! Ha, I'm with Brittney - I thought they were already done. :) That would be dangerous for me, I would leave them that way forever! Love your selection, such a pretty fabric! I thought they were already done too! Oh it looks great, very fun and colorful! Great colors. Red sort of gets a bad rap, but I think it's a great accent color. I still have remnants of red in my kitchen with an old school like clock and it makes me smile when I see the fun red. Great fabric ... and connection to dining room. Those curtains are beautiful....your kitchen is GORGEOUS. Can't believe how much you are taking on being preggo! I love the fabric! It looks great with the wall color. I love that fabric and have it pinned for my office. Seeing it as curtains has me thinking... It works perfectly in your kitchen. The curtains look great. What a terrific fabric choice! And no you don't need help... you guys are all kinds of productive over there! Love the fabric! What a great find! And don't worry about actually getting them sewn...they look fab just the way they are. And sewing curtains is not the most fun. Well in my opinion at least. looking good! how is baby bump doing!? That fabric is amazing!!! When I buy a home will come visit and help me pick out stuff. I would have NEVER thought of this type of fabric and I love it. I hate that even as an artist I don't think outside the box this much. It's absolutely perfect! I LOVE that fabric. LOVE LOVE. LOVE. I have been trying to decided what to do with our kitchen and really wanted to do a similar blue color while also incorporating my colorful fiesta ware. I came across this post and heard angels. So, desperately tried to find something at our local fabric store that was similar... and NOTHING. So, I got this exact fabric and it is gorgeous! Thank you for posting! It made my year! 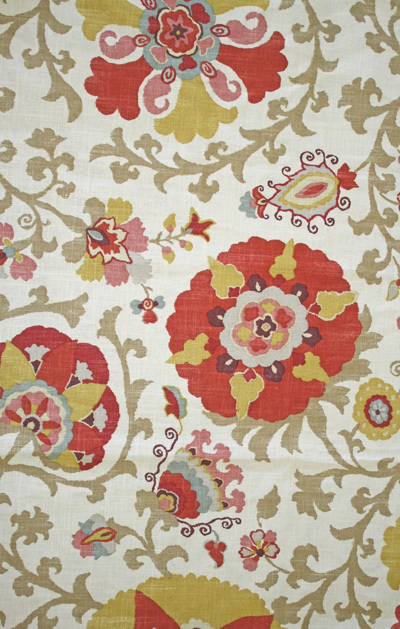 I love this fabric and am contemplating buying it for my informal dining room. I was wondering if you kept the width at 54 inches for the your panels or if you cut the fabric down the middle to make 27 inch panels? The fabric looks great either way and will look fabulous in your kitchen! Thanks for your help! Rebecca, I cut them in half to 27 inches. Sorry I'm just seeing this comment now!